controlgeek.net Infocomm Orlando 2013 Geekout! It's time for the controlgeek.net geekout at Infocomm Orlando 2013! Jim Janninck and I have rustled up three very interesting case studies, after which we will head out for drinking and bowling or miniature golf. Everyone is volunteering their time, and Full Sail is graciously donating their space, so there is no admission fee and all are welcome. Providing entertainment systems on board a floating resort is far from ordinary. Explore the system architecture and design decisions related to integrating audio, lighting, video, special effects, and rigging systems on board a state-of-the-art cruise ship. From interactive dining experiences, to the modern nightclub; from the outdoor sports deck, to the intimate sports pub; from the 3D cinema, to the grand showroom; the Show Control system touches almost all public areas on the ship. The shipwide system manages 37 Show Control systems spread across 27 venues, and coordinates inter-system communication, scheduling, user management, and show editing. The Jekyll and Hyde Club in NYC [Editor's note-my previous entry on this new attraction here] was built to create a flexible, guest-centered experience through the use of a semi-automated and live experience. For the restaurant, Weigl engineered a system that adapts as modular components are added and updated in the continuously changing experience. Technologies being controlled through the integrated system include: Audio, RGB DMX controlled lighting, moving mirror fixtures and animatronics. The completed system allows a single or small number of Equity stage actors to control the entire guest experience, as well as for the system to adjust the automated routines based on the inevitable changes that come from a live performance. Clock conservators in museums and galleries are frequently faced with the need to keep complex mechanisms in clocks made in the 18th and 19th century preserved in working order. 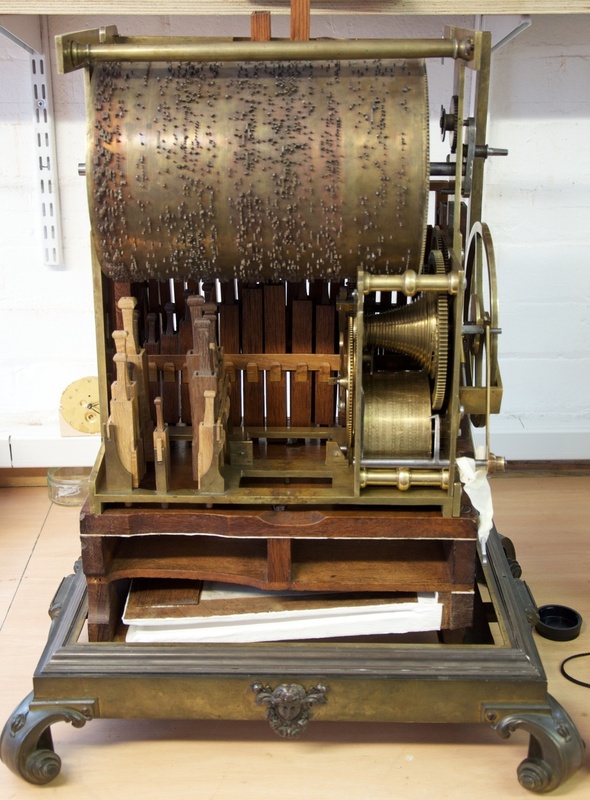 Whilst the clock movements are usually fairly simple and can be maintained with the minimum of intervention, for the carillon (musical box) movements and animated figures, the decision is often made to disable these features so that the mechanical parts do not degrade to the point that they either fail completely, or have to be modified using modern parts, thus compromising the integrity of the item. A number of galleries and museums have been investigating ways in which these features can be brought back to life using modern technology and this presentation will look at three such projects: one completed and two in progress, all involving 18th Century clocks, and using a mixture of off-the-shelf products and custom designed circuitry. I will post any updates to my twitter.